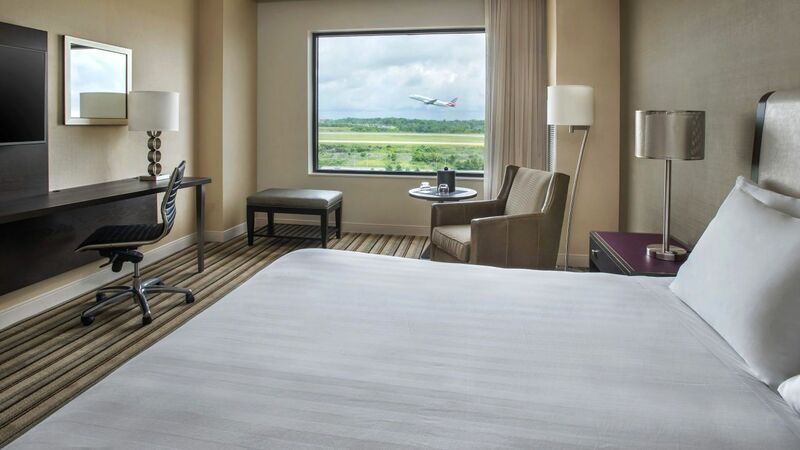 Relax and enjoy the comforts of home in our stylish hotel rooms near Pittsburgh Airport with state-of-the-art soundproofing, modern décor, and high-end amenities. 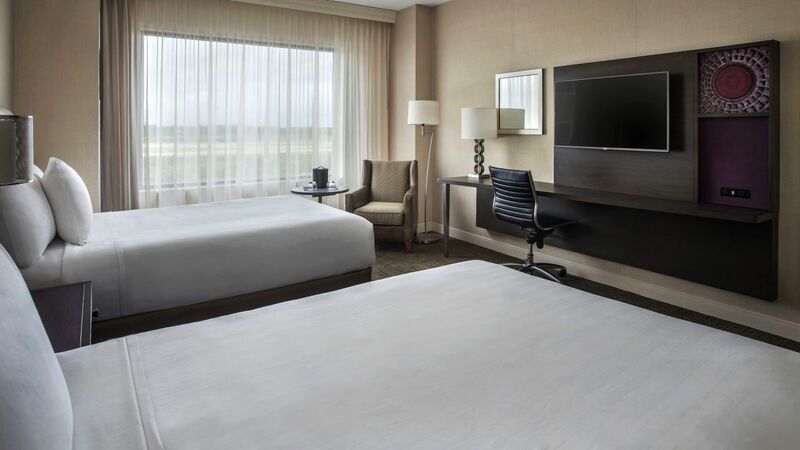 All of our guestrooms feature the signature Hyatt Grand Bed® with luxury linens, 42” LCD TVs, separate lounging areas, and KennetMD bath products. Stay productive at the spacious work desk with free Wi-Fi access, and dock your iPod® to the iHome alarm clock radio to play your personal playlists. 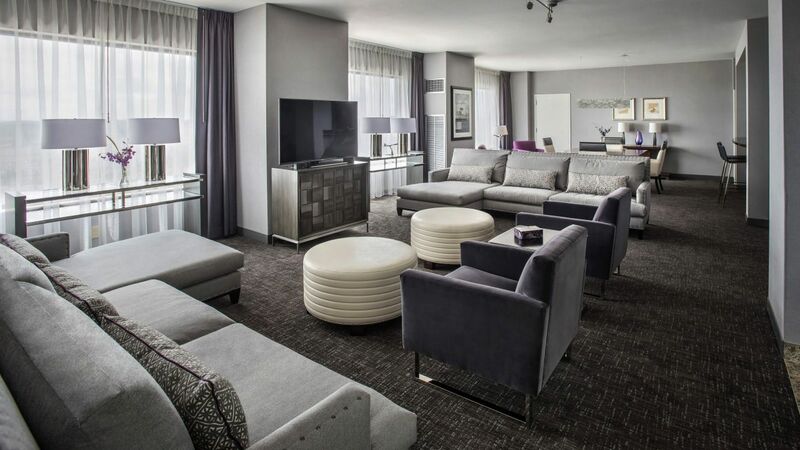 Take advantage of the additional space in this modern guestroom with king-sized Hyatt Grand Bed® and a separate seating area with comfortable couch and chairs. This is a standard suite. See World of Hyatt program terms for upgrade eligibility. 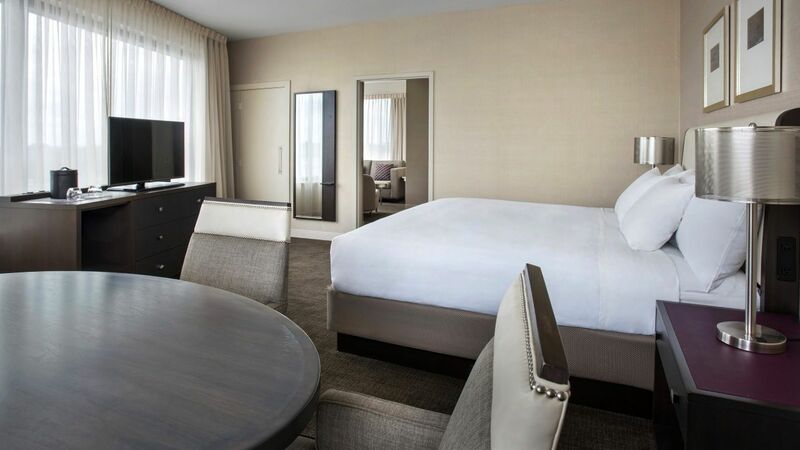 This spacious, modern oversized room features a parlor and separate bedroom, with one king-sized Hyatt Grand Bed®, down blankets and luxury amenities. This is a standard suite. See World of Hyatt program terms for upgrade eligibility. Host a private conference or book these spacious 730 sq ft accommodations when traveling with the family. One king or two double Hyatt Grand Beds® available. This is a premium suite. See World of Hyatt program terms for upgrade eligibility. 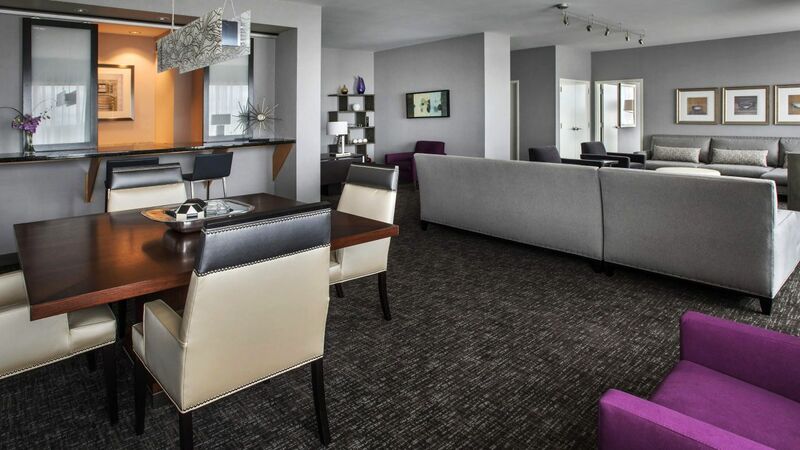 Entertain in grand style in this lavish 1,500 sq ft suite, featuring a kitchen, wet bar, separate workspace and spacious parlor with comfortable seating. This is a premium suite. See World of Hyatt program terms for upgrade eligibility. Modern, renovated guestroom with boutique-style décor and European flair accents. Features one king-sized Hyatt Grand Bed™, lush linens and deluxe amenities. Modern, renovated guestroom with boutique-style décor and European flair accents. Features two double Hyatt Grand Beds™, lush linens and deluxe amenities. Introducing a new smoking room experience. This room is perfect for those travelers who smoke but want to enjoy a fresh, clean air atmosphere. This ADA-compliant guestroom includes one king-sized Hyatt Grand Bed®, accessible roll-in shower, and numerous ADA-compliant amenities and bathroom features. This ADA-compliant guestroom includes one king-sized Hyatt Grand Bed®, accessible bathtub, and numerous ADA-compliant amenities and bathroom features. This ADA-compliant guestroom includes two double Hyatt Grand Beds®, accessible bathtub, and numerous ADA-compliant amenities and bathroom features. 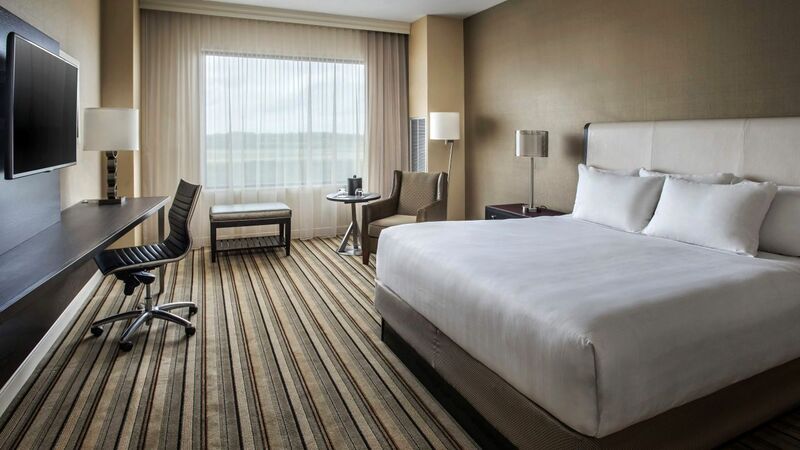 This ADA-compliant guestroom includes two double Hyatt Grand Beds®, accessible bathtub, runway view, numerous ADA-compliant amenities and bathroom features. This ADA-compliant guestroom includes one king-sized Hyatt Grand Bed®, accessible bathtub, runway view, numerous ADA-compliant amenities and bathroom features. Our PURE Hypo-Allergenic rooms undergo additional six-step process intended to reduce airborne particles and minimize the presence of potential irritants. Relax in supreme comfort in these soundproof accommodations, with one king-sized Hyatt Grand Bed®, down blankets, lush linens and deluxe amenities. Relax in supreme comfort in these soundproof accommodations, with two double-sized Hyatt Grand Beds®, down blankets, lush linens and deluxe amenities.